◆ I will understand Bloom’s taxonomy and the six levels of questions. ◆ I will be able to ask questions for each of the six levels of questions. Students will have example questions for each of the six levels on Bloom’s taxonomy and will have recorded these questions onto chart paper. ◆ Chart paper on which students can record their questions. ◆ Depending on the age of the students, this lesson will take approximately 60 minutes. ◆ We would teach the previous lesson on questioning first and then do this as a Part B to that introductory lesson on questioning. ◆ Explain that there are actually several different kinds of thick and thin questions and that a lot of people use something called Bloom’s taxonomy to categorize questions. What’s a Non Google-able Question? ◆ Show an overhead or screenshot of the Bloom’s taxonomy pyramid and explain that there are six levels: Remember, Understand, Apply, Analyze, Evaluate and Create. Take a few minutes to go through them all and explain them to the class. ◆Once they have picked a book, the students need to read the picture book together and then, using the picture book as the content, come up with a good example of a question for each of the six categories. ◆Have students display their chart paper along with the pic­ture book that they used and then do a Gallery Walk as a class so that students have a chance to see the work of their peers. Variation: You could also have students do a quick share to the whole class, or they could pair up with another group and share with each other. ◆Closure: Let students know that all of the six levels are impor­tant depending on what you are doing, but that for Genius Hour you are focused on meatier questions. Ask students which levels they think would work best for a Genius Hour project. Discuss as a class. Let them know that soon you will be going back to the passion/wonder board so they can pick their first Genius Hour inquiry question. ◆ Leave them excited to do more! Art: Chris Davis, Powerful Learning Practice LLC. 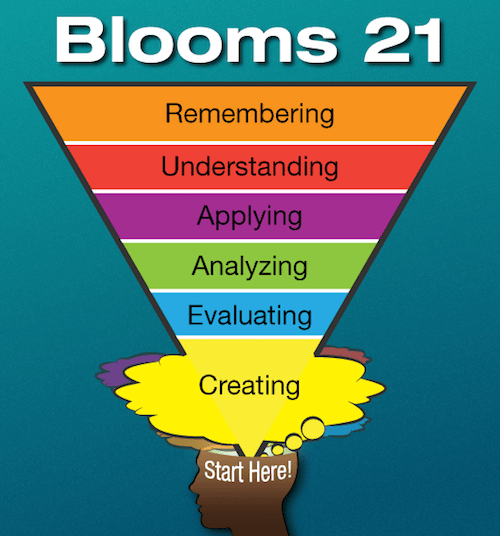 The “flipped” Bloom’s pyramid originally appeared on this 2012 post by Canadian teacher Shelley Wright. See what you think! Denise Krebs (@mrsdkrebs) and Gallit Zvi (@gallit_z) are co-moderators of the Twitter chat group #geniushour and co-authors of The Genius Hour Guidebook. After teaching in American K-8 schools for many years, Denise is now teaching English to second grade geniuses in a bilingual Arabic–English school in Bahrain. Denise currently works in Bahrain, teaching English to elementary-aged students in a bilingual Arabic–English school. Gallit is a Faculty Associate in Professional Development Programs at Simon Fraser University as well as a middle grades public school teacher in Surrey, British Columbia, Canada.